MeetMe is one of the most famous dating and chat apps on Android and iPhone. 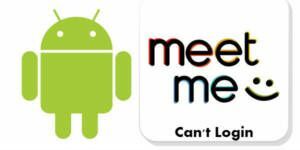 If you can’t login MeetMe in Android, you will find some solutions on here. There are many problems with login with the application. There are several ways to fix this problem. We are going to provide a few solutions for that. It will help you to resolve your problems quickly. However if our solutions doesn’t help you, we recommend you to contact with MeetMe staff because this can be related with your account. They will try to resolve your problem immediately but generally they used to resolve issues in next updates. Don’t forget to give detailed information on your phone model, application error, etc. If you had the error after an update, we recommend you to add that detail to your error report. MeetMe Can Delete My Account? Why Can’t I Login to MeetMe Using Facebook Anymore? There are many ways to resolve this issue in your phone. Reinstalling the app on your phone is the easiest way to get rid of problems. However we recommend you to read our guideline for reinstallation. Otherwise you may get error after uninstall and you won’t able to fix that error easily. If problem has occurred after an update of the app, you will need to remove recent updates. Removing update sometimes fixes errors in some applications. If you have downloaded application from unofficial sources, we recommend you to uninstall it and remove all files from your phone. Then install the application from main website of the application or Google Play. Downloading applications from official sources will keep your privacy in safe and it will also keep your phone in safe too. If all steps at above didn’t work for you, we recommend you to contact developers. MeetMe support already promises you about helping you about verification and password problems. You will need to mail support@meetme.com address. Tell your country, your registered mail to the application and your name. Add your problem and tell them you have problem with verification / password / registration / login / etc. These are some questions which has been picked by our staff. You can feel free to ask us with commenting this page. We are going to respond your questions as soon as possible. I can’t login to my MeetMe account it says invalid email or password. I even changed my password and still it doesn’t work. Please help. Welcome to How to Chat Online. Unfortunately you are facing with a very common error for MeetMe users. Sometimes they even tell that their account has been deleted. We have already got a complaint about that in our forums. If you are getting Invalid Login error on MeetMe, there is something wrong with your account, not with the application. However you can still try to login through mobile version of the website. If you are still getting the same error, please see above for all solutions. You will especially need to contact official support of MeetMe, however you can do all steps before contact them since they can provide a faster solution for you. I’m having problems with login meetme account on my Android phone Motorola Moto E4. I don’t know how to remove recent app updates from this phone, so I can fix the problem I have. I can’t login Meetme now. Thank you for asking on HowtoChatOnline Questions. Yes, unfortunately Motorola E4 hasn’t this feature. You can try reinstall the application alternatively. If you already have done that, you can search for apk file of the application on some android download websites. However it’s not the way we recommend since there are lots of viruses and malwares on these files. So what to do? Please tell your problem through support@meetme.com. You need to give detailed information about your problem. Error you see in the login screen, detailed information of your phone model, android version you use. While staff is working on your problem (however we believe that it will be fixed at next update though), you can try login to your account through http://m.meetme.com/. If you can login through to the website, it means there is a problem with application. If you cannot, it means there is a problem with your account. Please ask us if you have any question about this. Suddenly I got a login problem with application in my pc and android phone, even after the password reset it remains the same. I use windows 7 in my pc and android 7 in my phone. Can’t login MeetMe at the moment. Please help me to fix for the situation. MeetMe Login problems are the most common errors of the application and the website. You will need to contact to support about that. We have also given detailed information about this issue. However your problem is related with the account, it is not a problem about your device nor your application. You will get the best response from staff. Can MeetMe delete my account? I can start over please cause I am having so much trouble with the website. So I am asking if I can start over please get back with me *** @ yahoo. com Thank you….. It seems you are using only website version of MeetMe. You will need to do following to delete your account on the website. Login to your account on MeetMe. You will see the settings button at the top right of the website after you login. Click on settings button. Click on account. Scroll down and click on deactivate account. If you cannot login to MeetMe or if you have registration problem, you will need to contact MeetMe. Please click here to learn how to contact MeetMe support. I can’t log in to my account on MeetMe but it was working months ago and now it stop working. It wanted me to verify my account but when i punt my number, it doesn’t work. This problem can only fixed by MeetMe staff and they have already promised to help their users who has faced with this problem. You will need to mail to MeetMe support for fixing this issue. Run your browser in your device. Go to your mail address. Write “support@meetme.com” at To: section. Write “I Can’t Login to MeetMe” on Subject. Send the mail to staff and wait for the response. Made a second account on meet me but this issue kept bugging me, I do not know why… I log in with accurate email and password and it says your login is invalid why is that? I also forgot password it says to check you email for confirmation code i checked there was nothing. Please help me with account… i have two, please help me, thank you. Thanks for the questions. We have checked terms, rules and help files of MeetMe and we have seen that there is not any problem with two accounts. So the problem occurs because of a common problem. Login invalid problem is related with your account (also related with MeetMe servers), it is not about application. You will need to contact MeetMe about this situation. They have already promised to help their users about such problems. Go to your mail send a mail to “support@meetme.com”. Write your country in the mail. Write your email address which you have registered to MeetMe. Finally in the mail write what kind of problem you are facing while you try to login. Referring to the subject line, I had been using Meet Me App on my Android phone (OnePlus 3T) daily from last couple of month but today while I was using the app, I suddenly disconnected and got logged off. Being a Facebook user, I always use to log in by just using Facebook login on the app. Where there is no email id or password required, but today when I was suddenly logged off am not able to login as soon I go to log in with Facebook it’s says your login was invalid, if you forgot your password click forget below. In this case when I go to reset my password it’s ask for my old password which I don’t remember not able to recollect, how do I now reset my password. Click on arrow down button at the top menu. You will see your registered mail at contact section of the page. After you ensure about the registered mail to facebook, please go to your email, and check if there is any verification mail which you have received from MeetMe. If there is not, you will need to contact to MeetMe support directly. Please feel free to ask any kind of questions about usage of MeetMe. Have tried my PC and Kindle Fire HD 7 to sign in and it says invalid login. I entered my password in correctly and everything. I tried to get a code because I thought I may have forgotten my password, but I never got a code in my email. I can’t say it is good news for the invalid login problem of MeetMe. Especially if you are getting the error for both side (PC Browser and Android Browser/App). There is a possibility that your account has been deleted or MeetMe has blocked your account or your account needs a verification. Please check your emails or SMS first which you have registered to MeetMe. If there is any verification link or code, please follow the instructions in the mail/SMS. MeetMe is sending verification codes/links to their users randomly for clean fake/scam accounts. 1-) Login to your mail which you have registered to MeetMe. 2-) Type a title for your support request. 3-) Type your name which you use on the website on the mail. 4-) Type your email into the mail. (which you registered to MeetMe again). 5-) Type your country in mail. 6-) Describe your problem in the mail and send it. MeetMe staff will contact you but we are not sure it will be fast… We recommend you to not to expect much… They can even answer you days later. Why can’t I login to MeetMe using Facebook anymore? How can I fix the problem? There can be two reason of this problem. One of those reasons is your account has been removed. The other reason is you are having trouble with your browser. We don’t know which platform do you use on MeetMe. However I will answer for PC on here. Well, if you can reach your account through searching it on Google or MeetMe, it means it hasn’t removed. We recommend you to change your browser to login to the website through Facebook. If you don’t want to use another browser, you will need to reset settings of your current browser. You will lose all data after you reset it though. (If you have google chrome, you can recover it with Google Sync though). 2-) Click on three dot menu at the top right. 3-) Select “Settings” from the menu. 4-) Click on Advanced in Settings page. 5-) Scroll down until you see the Reset section on the page. If you are using any other browser or mobile platform, please let us know. I had the suspicious activity email. Couldn’t change my password because it asked me to Verify my account via phone number. Typed in my Verizon email and it said it was invalid. I sent support a message. They didn’t reply. I cleared my browser on my computer and phone (same thing) then i created a new account on a new email and it worked for like 30 minutes then it signed me out and the same thing happened. 1-) Clear all data and cache on your phone about MeetMe. Uninstall the application from your phone. Please ensure that. You have also cleared cache of your browser, if you are connecting to the website with browser application. 2-) Disconnect your phone from Wifi and mobile network connection. Unplug your router and wait for 30 seconds. 3-) Plug your router again. 6-) Install MeetMe application from App Store and get a new account with a different email address. Please do not use your phone number or Facebook account or old email addresses which you have used on MeetMe before. I believe these steps are going to work for you. I’m having login issues on meet me I put in the correct phone number and it still says it’s invalid and I haven’t been given a confirmation code. If you are having this on a phone device, we recommend reinstall first. (Uninstall the app and then install it again.) If it doesn’t fix your problem, that will be better if you contact MeetMe directly. I think you are having an issue with account removal. This can happen on the application at times and there are many user complaints about this recently. Ensure that your account is also alive on MeetMe from Google Search results or asking a MeetMe friend that you can contact other ways. How i cannot login to myccount. And i never get link email if i use forget password. Please reply. Thanks. I can’t log in, I sign-up the first time on 29 March with my fb, than on 1april the app closed out of the sudden. Since i used my fb to login i coldnt make the change password that the app was asking me. I even tried to press the forgotten button i didn’t received any email. ( I lost all my contacts) I uninstalled de app, restart the phone… didnt work. So i downloaded the app this time i made a new registration using my email and all my info. Used the app for 1 hour that the app closed again, and everytime that I try to sign up I receive password or email incorrect. Or the app puts me in the page to change my pass and keeps telling me that my old password is incorrect. I can’t login my meetme on my phone please can you guys just fix this problem? App never works right. No one will contact you back. Clearly they don’t care about their members. I will just delete the app and find something better! Any Attempt That I have made to get back on line displays a blank screen. There is nothing else that I can do from my end. I did the codes three times, I did the scrambled words, the eighth time they kept displaying another se of scrambled words, yes I un-scrambled clearly, tried lowercase, and uppercase letters and numbers. That is when I Did get MeetMe page displayed. This is hopeless, I did everything I could from my end, been through all MeetMe, codes scrambled words, numbers, I got my cell number through. All I get is a white page. Thanks, I guess. I have meetme on my tablet but I’m trying to logging to my account I already have that’s on my tablet to my phone but it went let me I even tried the reset password and my same email I used before but it went let me help !!! I tried logging in with Facebook but it says no email when I clearly used an email to get into Facebook, it comes up with the confirm to use Facebook then it says logging in then a red sign saying no email address. Eddie I’m also facing the same problem… could you fix it?